The Singular Lacy Rib stitch is a type of rib stitch that is accompanied by a column of “wrapped” stitches which resembles the bamboo stitch. 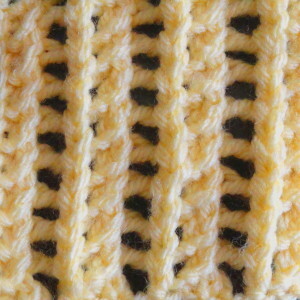 These two stitches are separated by yarn overs which produce the lace portion of the pattern. The Singular Lacy Rib is simple and easy to knit and has an excellent drape. This stitch pattern is perfect for large projects such as scarves, blankets and throws. Row 1 (RS): k1, *yo, k2tog, p1, k1; rep from * to end of row. Row 2: p1, *yo, p2tog, k1, p1; rep from * to end of row.